The lending industry is comprised of a wide variety of sectors, such as banking, credit cards, mortgages, leasing and consumer finance. Many of these sectors have interconnections and synergies. In addition, a large number of related services and technologies have a major influence on the lending and credit business. Meanwhile, international acquisitions are shaping up the globalized banking industry of the future. 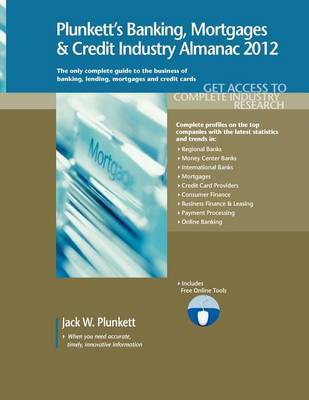 This carefully-researched book is a banking, credit and mortgages market research and business intelligence tool-everything you need to know about the business of banking, credit cards, mortgages and lending, including: money center banks; regional banks; savings associations; brokerage; home equity loans; credit cards; globalization of the banking and lending industries; and other services provided by non-bank enterprises. Analysis includes significant trends in banking and lending technologies, risk analysis, payment processing, call centers and other support services, online banking trends, ATMs and software. This book includes our profiles of 325 of the world's leading firms in the banking, mortgages and credit industry. Purchasers will find a form in the book enabling them to register for 1-year, 1-seat online access to tools at Plunkett Research Online, including the ability to view the market research/industry trends section and industry statistics. You have access, at no additional charge, to the very latest data posted to Plunkett Research Online. Online tools enable you to search and view selected companies, and then export selected company contact data, including executive names. You'll find a complete overview, industry analysis and market research report in one superb, value-priced package. "The Plunkett series of directories are well known for providing company and industry information on clearly defined subject areas." -- American Reference Books Annual "American Reference Books Annual"
"Plunkett's almanacs were designed to be a source for all researchers, especially market research, strategic planning, employment searches, contact or prospect list creation and financial research...This volume is recommended for academic, business and large public libraries." -- American Reference Books Annual "American Reference Books Annual"
"Plunkett Research has built a solid reputation providing industry analysis and research in a diverse spectrum of areas - energy and utilities, finance and investment, health care and biotechnology, and engineering and research to name a few." -- American Reference Books Annual "American Reference Books Annual"